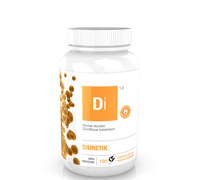 To regulate transient water retention in a safe way, choose Diuretik! Emptying of the urinary tract and its functional optimization. Improved liver and kidney function. 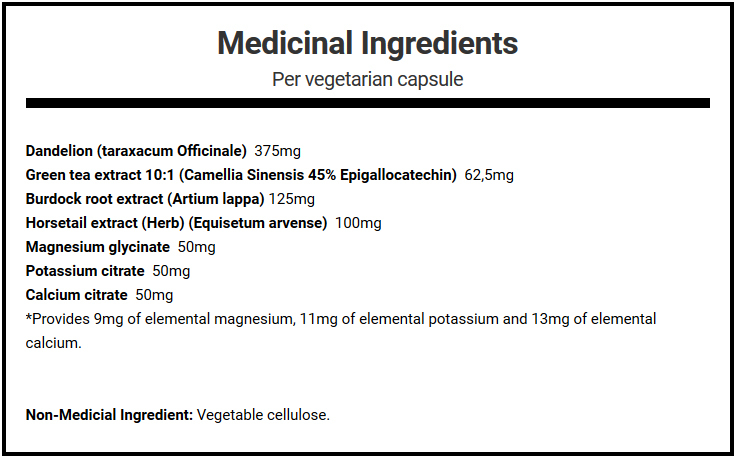 Encapsulated in vegetable capsules, completely free of chemical excipients, using only plant cellulose. Recommended use or purpose: Dandelion is traditionally used in Herbal Medicine to increase the amount of urine to achieve flushing of the urinary tract as an adjuvant in minor urinary complaints. Used in Herbal Medicine as a diuretic. Used in Herbal Medicine as a laxative (aperient). Used in Herbal Medicine to help increase bile flow (choleretic). Used in Herbal Medicine to help treat digestive disturbances (dyspepsia). Source of antioxidant(s)/Provides antioxidant(s) that help(s) fight/protect (cell) against/reduce (the oxidative damage caused by/cell damage caused by) free radicals. Source of/An electrolyte. Helps to maintain normal muscle function. Helps in the process of normal regulation of cell division and specialisation. Helps to maintain normal electrolyte balance. Recommended dose: Adults : Take 2 capsules 2 times daily. To ensure an increase of the amount of urine, adequate fluid intake is required during treatment. Take a few hours before or after taking other medications or natural health products. Take with food. Recommended duration of use: For occasional use only. If symptoms persist beyond 2 weeks, consult a healthcare practitioner. Contra-Indications: Do not use with other potassium-containing supplements or with potassium-containing salt-substitutes. Do not use if you are allergic to plants of the steraceae/Compositae/Daisy family. Do not use if you are pregnant. If you have heart disease, high or low blood pressure, kidney or liver disorder, diabetes or edema (swelling of hands, face and feet) or are taking products containing diuretics, do not use. Stop use and seek medical attention immediately if you experience dizziness, confusion, muscle weakness or pain, abnormal heart beat and/or difficulty breathing. Cautions and Warnings: If you have gall bladder diseases, and/or intestinal obstruction, consult a health care practitioner prior to use. If symptoms persist or worsen, consult a health care practitioner. Consult a health care practitioner prior to use if you are breastfeeding. Consult a health care practitioner prior to use if you have an iron deficiency. Known Adverse Reactions: Hypersensitivity/allergy is known to occur, in which case, discontinue use.